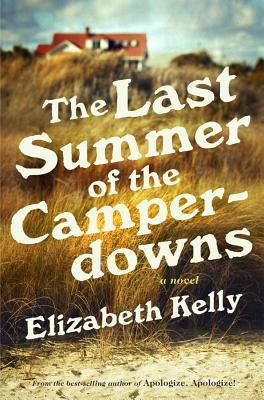 Elizabeth Kelley's novel The Last Summer of the Camperdowns is fantastic! I was immediately engaged and absorbed by Kelley's unique writing style. her character development of the Camperdown family and their friends and neighbors is brilliant and each person contributes to the family's dysfunctional lifestyle on Cape Cod (my native lane). Some of the scenes are hilarious, yet others are so intense they left my heart racing. This novel has it all - politics, infatuation, secrets, scandals, revenge... It is a quick and compelling read. The Last Summer of the Camperdowns, from the best-selling author of Apologize, Apologize , introduces Riddle James Camperdown, the twelve-year-old daughter of the idealistic Camp and his manicured, razor-sharp wife, Greer. It's 1972, and Riddle's father is running for office from the family compound in Wellfleet, Massachusetts. Between Camp's desire to toughen her up and Greer's demand for glamour, Riddle has her hands full juggling her eccentric parents. When she accidentally witnesses a crime close to home, her confusion and fear keep her silent. As the summer unfolds, the consequences of her silence multiply. Another mysterious and powerful family, the Devlins, slowly emerges as the keepers of astonishing secrets that could shatter the Camperdowns. As an old love triangle, bitter war wounds, and the struggle for status spiral out of control, Riddle can only watch, hoping for the courage to reveal the truth. The Last Summer of the Camperdowns is poised to become the summer's uproarious and dramatic must-read.